Some signs come as subtle hints and others are more like shoves off a cliff where there’s no turning back!!! I just got a shove off the cliff!! Another one!! I’m learning to love the freefall…!!! In early December ’17, I received a message out of the blue from a beautiful woman who had just lost her Grandmother. She told me her Grandmother had been an astrologer for 30yrs and traveled the world learning her art. She wondered if I’d be interested in any of her books as her Grandmother would have wanted them to go to someone who would deeply appreciate them and put them to good use. How did she find me? Two years prior, I randomly joined a ‘buy and sell books’ group and put a single post in the group asking if anyone had any astrology books? Two years prior!!! Late the next afternoon, I set off on the 45min drive to see if I was interested in any of the books. 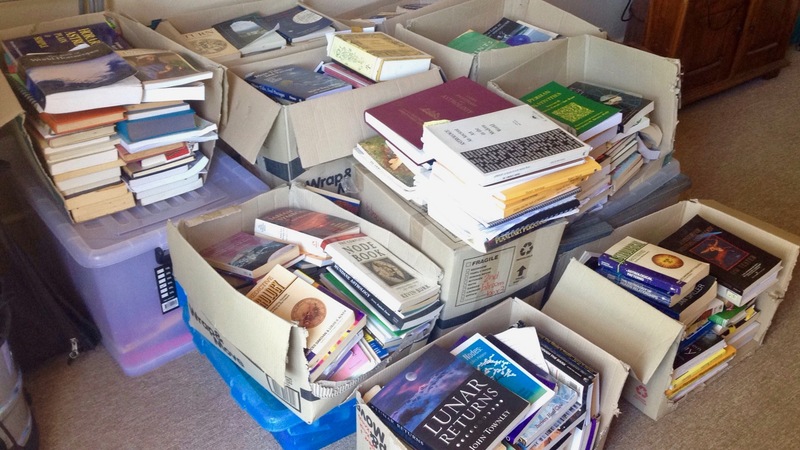 I arrived around 5pm to have a ‘quick look’ and ended up leaving 5.5hrs later after listening to life histories and sorting through 20 boxes of magic books on a myriad of fascinating topics – 10 boxes of astrology books and 10 boxes of ‘other’. That night I had to leave the books behind and figure out how I was going to move them as there were too many to fit into my car. And then… life happened… almost 2mths passed by amongst frustrated (fated) attempts to organise the transportation of the books from her home to me. And then… on Jan 31st, the Leo lunar eclipse day (a highly significant day for me in relation to my own astrology chart), an opportunity spontaneously opened up for me to pick them up! Now I can put to rest the crazy thoughts I’d been having about returning to uni to uplevel my psychology degree to a Masters. I have my higher degree to get right here in amongst all these astrology text books and the experiences I’ll have as a result!!! I am deeply grateful to Mel for randomly finding me in a ‘buy and sell books’ group, to her Grandmother, Merrill, who will be guiding me for some time to come from another dimension and through her book collection, and to Claire Voyant for also reflecting to me that this is my ongoing pathway to a higher degree and for helping me to collect my new text books. I think they’re going to keep me busy for quite a few semesters to come!!! Remember to value ALL the little things you do in the pursuit of your passion, purpose, happiness… *insert your own word here*… like joining a random ‘buy and sell books’ group!! !